How Much Can the 2019 Honda Pilot Tow? When choosing a family SUV for your Elgin and Schaumburg drives, it’s essential to choose a model that won’t hold you back. Note well, the 2019 Honda Pilot towing capacity makes it the right tool for any job! Models equipped with front-wheel drive will be able to handle an impressive 3,500 pounds. With Intelligent Variable Torque Management™ All-Wheel Drive, your maximum capacity will jump to 5,000 pounds. That’s more than enough to move your favorite outdoor sporting goods, haul a small camper, or pull a jam-packed trailer! Intelligent Traction Management: Even models with front-wheel drive offer an Intelligent Traction Management setting for use in the snow! Those with all-wheel drive offer similar settings for the snow, the sand, and the mud, so you can be ready for anything life throws at you. Intelligent Variable Torque Management™ AWD: When you equip the Honda Pilot with all-wheel drive, this vehicle will respond automatically to any loss of traction, directing extra power and torque to the wheels that need it before you ever notice the difference. It’s available as an upgrade on all trims other than the Elite, where it comes standard. Multi-Angle Rearview Camera: Hooking up your trailer and backing into parking spots both become a whole lot easier when you take advantage of the top-down, wide-angle, and normal viewing modes offered by this SUV’s standard rearview camera. Guidelines are standard on the baseline trim, and Dynamic Guidelines come standard on the EX trim and up. Hill Start Assist: The Honda Pilot can detect an incline, and it will help you get moving on a hill by keeping the brake applied after you hit the ignition, while you move your foot to the gas pedal. It’s standard across all trim levels. The 2019 Honda Pilot interior can seat up to eight passengers, and it’s easy to convert passenger space into cargo volume when you need it. With all seats upright, the 2019 Honda Pilot cargo volume is equal to 18.5 cubic feet. Lower the 3rd and 2nd-row seats, and you’ll have access to 55.9 cubic feet and 109 cubic feet, respectively. When planning your trips and loading up with cargo, it’s important to keep the 2019 Honda Pilot maximum payload in mind. This ranges from 1,420 to 1,625 pounds, depending on which trim you choose. Get behind the wheel of a new Honda Pilot for sale in Crystal Lake, and see how it handles the roads of Barrington and Cary. 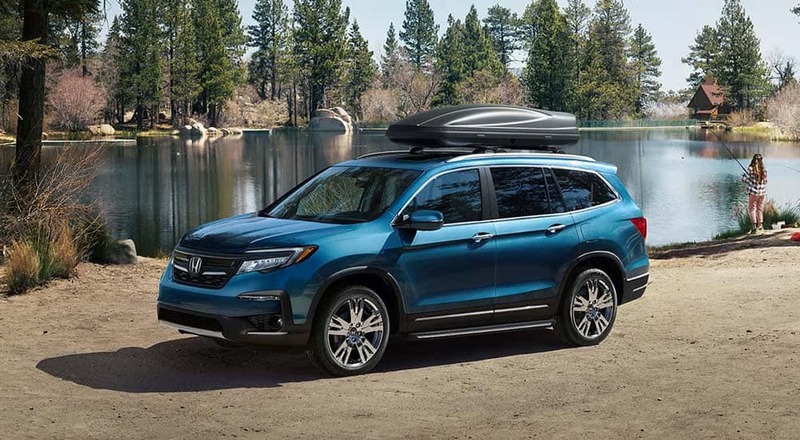 Our large selection features Honda Pilot models in all of your favorite colors, and once you’ve had the chance to explore the 2019 Honda Pilot safety features, you’ll see why it’s favored by families all across the Schaumburg region. Contact us today to schedule your test drive. 0 comment(s) so far on How Much Can the 2019 Honda Pilot Tow?